Joe Kinder is back on the road again after spending much of the first half of 2009 based in southern Utah. Recently he was up at Horne Lake near Vancouver, BC redpointing A.D.A.T.O (5.14b), Dinosaur Highway (5.14a) and Driven (5.14a). After moving to Utah from the Midwest, Brad Weaver is back in sport climbing shape as evidenced by a slew of quick redpoints at Maple Canyon. In recent weeks he has sent 5 5.13c, 2 5.13d, 2 5.14a and 2 5.14b. Speaking of Maple Canyon, 54 year old Chuck Odette has been climbing well there of late as well sending a couple of hard 5.13s/easy 5.14s. Check out this interesting, and at times funny, article from 2001 for more about the amazingly youthful looking Odette. Jonathan Siegriest did the 4th ascent of Primetime To Shine (5.14b) at Clear Creek Canyon, CO on his first attempt of this link-up of the cruxes of routes Primeval (5.13d/14a) and Shine (5.14a) which he had done previously. 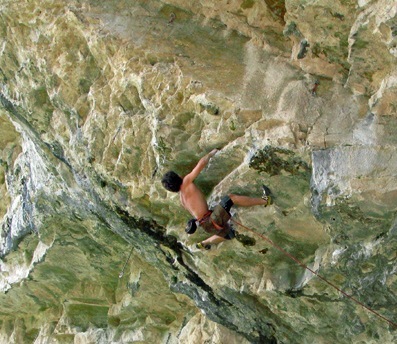 Will Stanhope recently did the 5th ascent of Sonnie Trotter’s Cobra Crack (5.14) in Squamish, BC. More at his blog. Adam Ondra continued his mission to repeat old, unrepeated Alex Huber sport routes last week when he did Om (5.14d) at Endstal, Germany. PlanetMountain has a cool article where they talk to Huber about Ondra and the state of hard sport climbing. Word on the street is that the marriage of Beth Rodden and Tommy Caldwell is over. While the interpersonal relationships of climbers is not normally appropriate for discussion on this blog, Beth and Tommy had built a pretty powerful brand around their being a climbing couple so the fact that they are no longer together seems like “news”. What couple will come along and pick up the torch? Chris & Daila, Joe & Colette…??? Between the Beth & Tommy news and the recent Jon & Kate developments Mrs. Narc is a wreck! this is too bad. as a man married to a staunchly non-climbing wife, it can sometimes seem that relationships based on the “play together” principal would be devoid of at least one source of strife… but life is hard for everyone, in all walks. i hope they can each walk away without latent bitterness tainting their futures. i think all the couple-based ads easily set up a number of quick ‘harmless’ jokes that i’m trying to leave unsaid and i hope others do as well. hopefully this means that the alarcon/jv cali bouldering crew will be consistently one stronger so i can get some goddamn blog posts up in here. or maybe it’s better with nothing on the radar. i’m slowly going mad in the office. not even billing tons of time to make me feel massive progression. updating models/templates in the down time. like changing the 0s in code. TPS report: FAIL. 77% of all marriages fail. The percent rises to 81% if they marry before turning age 25. 5 out of 4 couples cheat on their spouse, and 97.8% of all statistics found on the internet are made up on the spot, 73% of the time.